“I must find a new resting place. There you will bring the coffin with my native soil... and then, Andreas, I have other plans!" I’d like to think that The Return of the Vampire was a big deal when it was released. Even though it wasn’t the first time Bela Lugosi had played a vampire since Dracula, it had been nearly a decade since he’d donned a cape and fangs in Mark of the Vampire. If this sort of thing happened to today, it’d probably be accompanied by all sorts of internet buzz hyping up a comeback for the beleaguered actor who in this case had spent the last decade clinging to his less famous Universal roles when he wasn’t slumming on Poverty Row. 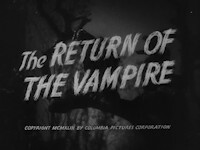 In reality, though, Return of the Vampire just seems to indicate how typecast Lugosi had become; despite being a major studio production, one can probably imagine that the suits at Columbia saw easy money in slapping the words “Lugosi” and “vampire” up on the marquee, and the film plays out much in the same fashion. In fact, the opening act could probably best be described as briskly condensing the plot of every vampire movie ever. We’re introduced to the mysterious vampire, Armand Tesla (Lugosi, who remains off screen for a while), and his werewolf assistant (Matt Willis). 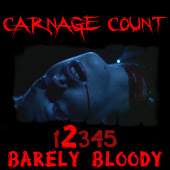 They’re currently terrorizing a victim who gets taken in by Lady Jane Ainsley (Frieda Inescort) and Professor Walter Saunders (Gilbert Emery); the latter has somehow figured out that their patient has been bitten by a vampire, and his suspicions are confirmed when Lugosi shows up that night to finish the job. He gets distracted by Saunders’s young granddaughter, Nicki, and attacks her as well, an act that spurns the old man and Lady Jane to track down the vampire’s resting place and end his existence forever. Maybe they didn’t quite drive the stake deeply enough, though, because he returns a couple of decades later in war-torn Britain after some local grave robbers and some German bombers awaken him. It’s here that the plot finally wheels itself into motion, as Lady Jane is still kicking around, as is little Nicki, who is now all grown up and ignorant of her encounter with Tesla. Maybe that was the first instance of Twilight-style imprinting because he’s still quite allured by her, and I wonder how racy this might have felt back in ‘44. While there’s nothing remotely overt about it (obviously), there’s always a sort of underlying sexual and predatory vibe whenever you deal with vampires, and audiences had no doubt been conditioned to the images seen here, namely that of Lugosi’s shadow looming over and eventually descending upon a sleeping girl. But the fact that it’s a little girl early on was probably quite stirring and likely preyed on the fears of the other (very real) Germanic predators of the age. That’s about the only way The Return of the Vampire taps into wartime fears; otherwise, the setting is merely incidental and the proceedings rather rote, save for the assist Tesla gets from those bombers, who actually return as a curious deus ex machina that couldn’t have gone over too well with contemporary audiences. Tesla does assume the identity of a doctor that Lady Jane helps to recover from a concentration camp, though this device just seems to be in place to give Lugosi a chance to throw on that debonair front he so masterfully displayed in Dracula. Lugosi is, of course, quite good in the role, having not missed a beat since Mark of the Vampire. Exuding both charm and menace, he commands the screen anytime he appears and perhaps compensates for the little intelligence that Tesla seems to possess. For whatever reason, he flips the mirror in his hotel room around, which clues in Lady Jane and the police inspector who is skeptical of Tesla’s vampiric status. Of course, Lady Jane comes off as being a little daft herself, as you’d think she’d recognize Tesla the minute he walks into the room disguised as the doctor she helped to free. Plot issues aside, The Return of the Vampire still manages to be quite fine, if only because Lew Landers often keeps us situated in fog and shadow-drenched set-pieces. Columbia didn’t exactly break the bank on it being one of the “Little Three” among the majors, as evidenced by the relative lack of set pieces, though the cemetery set is well-realized. Lugosi’s wolfman assistant is quite neat, too, and seemingly an attempt to cash-in on the monster mash craze that would crescendo that same year when Universal released their first rally flick, House of Frankenstein. It’s a shame Columbia couldn’t get Chaney to essay the beleaguered werewolf, but Willis is a suitable stand-in. He goes through the typical self-loathing motions--he doesn’t want to be a wolfen slave to evil, but he can’t resist Tesla’s hypnosis (shockingly, though, the film doesn’t feature that trademark gaze from Lugosi). It does, however, possess a face-melting sequence that I know was ghastly at the time, and it’s a delightfully quaint and grisly trick these days. The Return of the Vampire sounds like a grand event--one could argue that the title even subtly refers to Lugosi himself, who certainly was the vampire to audiences of the age--but it comes with little real fanfare. As a film, it certainly coasts a bit on the novelty of seeing Lugosi back in the cape, but, in hindsight, it sort of sadly encapsulates how stagnated his career had become. Once a huge star, here he is clutching to past glories in a film content to do faintly echo the better films that preceded it. The Return of the Vampire is certainly not a bad film, merely one that feels a bit perfunctory in many ways. Check it out after you’ve seen the rest, as it’s easily a big-time curiosity piece for horror fans.